It’s NEVER a good idea to test new designs, programs and/or learn new stuff on a production website. This article describes how to create multiple virtual servers on a Windows 7 platform using XAMPP to create a perfect Linux/Apache like test bed. I’m in the process of re-factoring some websites I’ve let go fallow far too long. Part of this process includes setting up a Linux-like test site on my brand new Windows7-driven Lenovo U350 via XAMPP. … The program is released under the terms of the GNU General Public License and acts as a free web server capable of serving dynamic pages. XAMPP is available for Microsoft Windows, Linux, Solaris, and Mac OS X, and is mainly used for web development projects.. In short, XAMPP gives me a Linux/LAMP development platform on a Windows based machine. By default, “localhost” is the default domain name for your PC. It resolves to IP address 127.0.0.1. But just as a hosting provider can support several domain names on a single IP address, so too can your Windows system. Save it, close your notepad editor, so you don’t shoot yourself in the foot in admin mode. Keep in mind, the primary purpose of XAMPP is to give you an Apache server that runs on your local machine. Note, in the default XAMPP install, the above is commented out, and the hosts are dummy and dummy2. I simply un-commented everything and renamed dummy2 to drupal. Finally, you’ll want to test it by entering “drupal” in the address bar of the browser of your choice. … and then add an index.html, .php, .pl OR .py file to provide the ubiquitous “Hello World!” to demonstrate everything is running as planned. I’m not the first person to write on this topic, nor will I be the last. That said, here are some other sites that offer similar tutorials in case the one above is still as clear as mud. Some of you may be wondering why bother at all? Why not just work on your live site. Personally, as an IT professional with a couple of decades experience, I can say with utter certainty – backed-up with copious examples – that this is a recipe for disaster. Instead, why not simply take an old box and install a Linux distribution such as Ubuntu or Fedora … or do what I did, took a new box an added XAMPP. Either way, you’ll be glad you did when one of your tests or learning experiences fries your non-production site. Agreed! It is almost always a bad idea to try something new on a production box. (never say never). Having an alternate development box (aka demo box) has saved me a ton of work and a ton of downtime. This is what I’ve done for our church site; I have a linux server running at home (that may be a deal breaker for most!) and I have the live site running at our hosting provider. Once a week (or so 😉 ) I download the live site files and a database dump, check it all into a subversion repository (reviewing any unexpected changes), and then throw the changes onto the demo server running on my home-hosted linux box. As it so happens, we are also in the midst of changing hosting providers; so I have yet a third copy over on that new hosting provider — waiting for me to get enough courage to actually pull the domain transfer switch 🙂 So when I get the changes onto the demo site, I also throw them onto the new hosting site. I mention this because it cost under $100 a year to maintain the second hosting site (hosting costs + a domain name), and requires no one to run a linux box from their house. It’s something to consider as a way to develop, get a feel for performance, and test those site backups you might have purchased 😉 — it’s not so good for rapid development or immature code because of the delays in editing the files and lack of access to raw log data, but if you just want a place to try out a new module, or make a site-wide tweak to a css to see what happens, having that second site is really something to consider. It’s also been great as a play area for training new folks on how to use the site. Just a few thoughts.. Thanks for listening! XAMPP is a good tool. Two additional pieces of info. 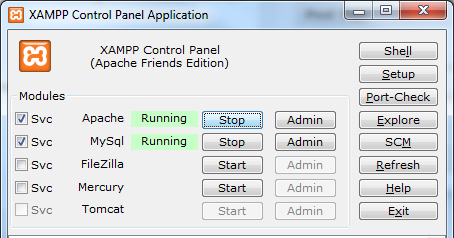 Though XAMPP comes with a mac flavor, many mac heads prefer the MAMP project over at http://www.mamp.info. I don’t run mac. So I can’t comment. Again thanks for the article, was very helpful.